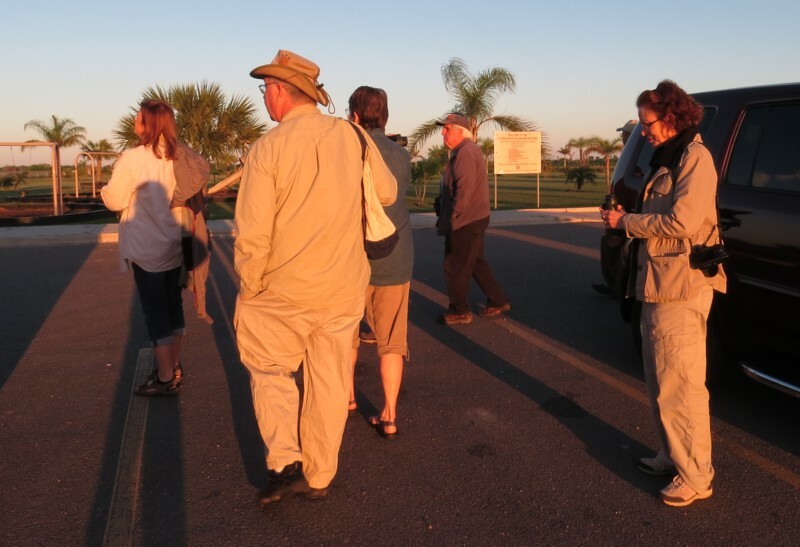 We had an incredible 18 people show up for this month's Birder Patrol trip, which was billed as a Grasspiper Hunt, but we ended up kinda going by the seat of our pants! It was definitely a joint effort, as Pat Heirs had gotten some skinny from the Stanfords about a huge mess of Golden Plovers on one of the Farm Roads north of San Benito, and Alicia knew how to get us there ☺, but we started at the La Feria Nature Park, which was new for a lot of folks (the young couple who undoubtedly thought they had the whole place to themselves were probably overwhelmed when they were suddenly surrounded by five vehicles ☺). 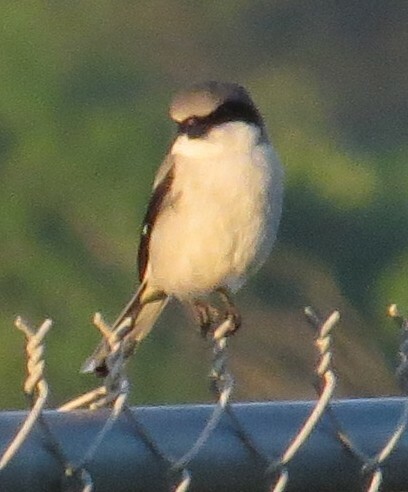 The resident Loggerhead Shrikes greeted us right away along with a pair of tittering Tropical Kingbirds, and an Upland Sandpiper called overhead, giving us hope for more grasspipers later! A couple of Great Blue Herons flopped in the distance before we made our way to the overlook, where the main players were Coots and Shovelers, along with a Great Egret bullying a Snowy Egret, and lots of turtles sticking their heads up wanting a handout! Tree Swallows were swooping low over the water along with the occasional Roughwing, and Eastern Meadowlarks sat up and eventually sang. Someone spotted a Least Bittern shooting into the reeds, but unfortunately he stayed hidden while a male Common Yellowthroat sat up and showed off while we waited. 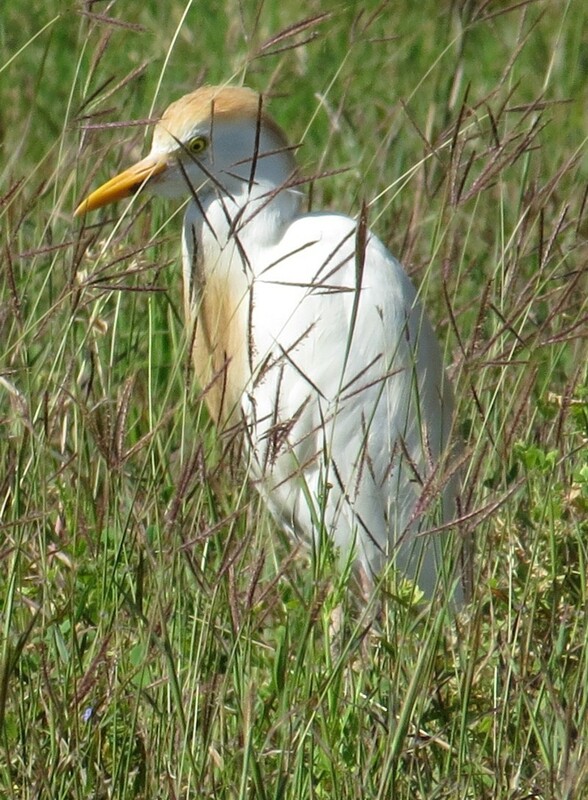 On the way out a Marsh Wren gurgled, and a Bronzed Cowbird sang as we piled into the cars. 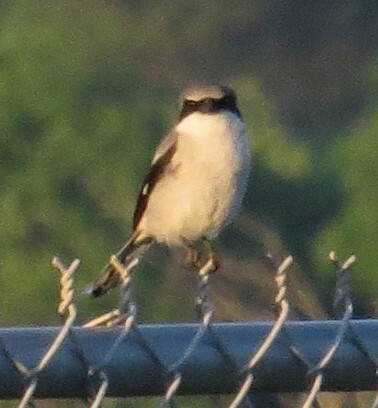 ...and is greeted right away by one of the resident Loggerhead Shrikes! 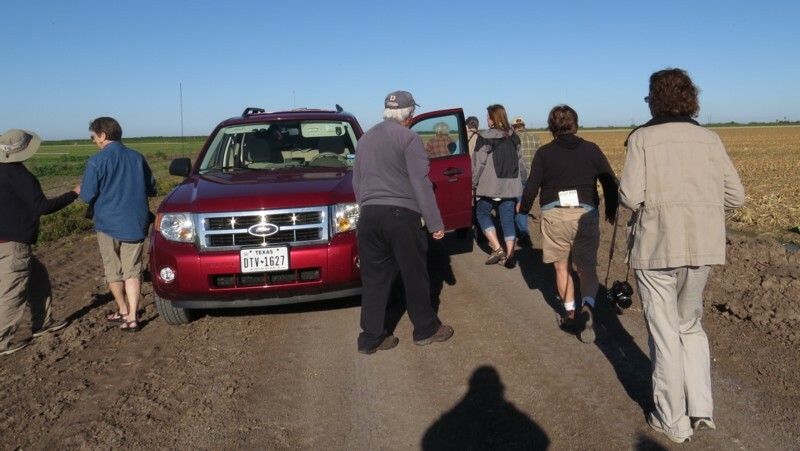 We had heard that the La Feria Sod Farms were no longer sod farms, but I figured that dirt road that crosses the fields might still harbor a Sprague's Pipit, so we wheeled down with our heads hanging out the window, listening for that sharp pike! call. No such luck, but we did get several Horned Larks, however, along with oodles of Savannah Sparrows (Baceliza thought she had a Grasshopper Sparrow, but we couldn't refind that one...). Rex had reported that the whole of Weaver Road was dry, so that was our next destination, and once down to the north side of the sod farms on that road, we hit pay dirt with at least three Upland Sandpipers in the field, and two more that came in close overhead later! 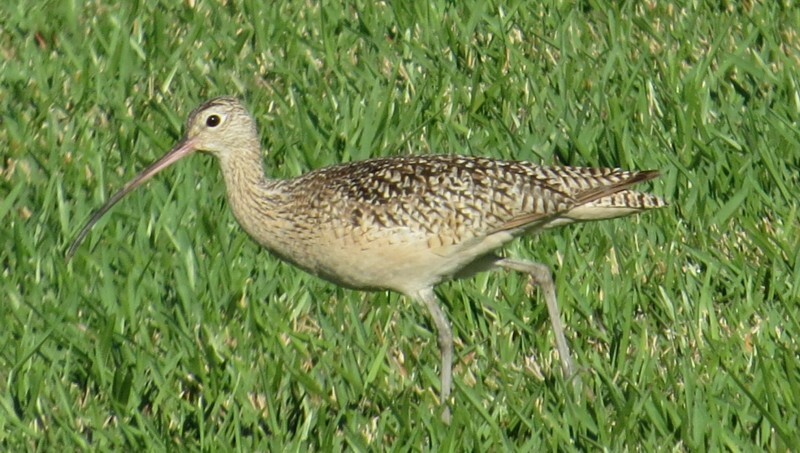 A pair of Long-billed Curlews showed up down the road, but that was it for the shorebirds there. Jimenez Road proved to be productive, however, as a stop past the little bridge yielded not only the expected Cave Swallows, but a few Valley specialties such as Kiskadee, Olive Sparrow, Chachalaca, White-eyed Vireo, and a cooperative Ladder-backed Woodpecker on the pole! But the big excitement was a liftoff of Broad-winged Hawks (just a few, but in great light)! Down at Rangerville Resaca we padded the list with a family of Pied-billed Grebes and their stripy babies, a nice Yellow-crowned Night Heron, a fly-by Hooded Oriole, and more flights of hawks, this group including Swainson's in with the Broadies and Turkey Vultures (and a Caracara that looked kinda lost)! But before long one of the guys spotted a big ball of birds circling in the sky that turned out to be kettling Anhingas! That was pretty cool! 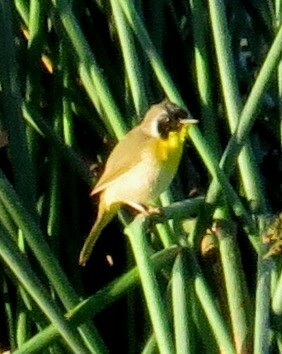 We also picked up singing Inca and White-winged Doves, a Belted Kingfisher, and a Green Heron across the street. 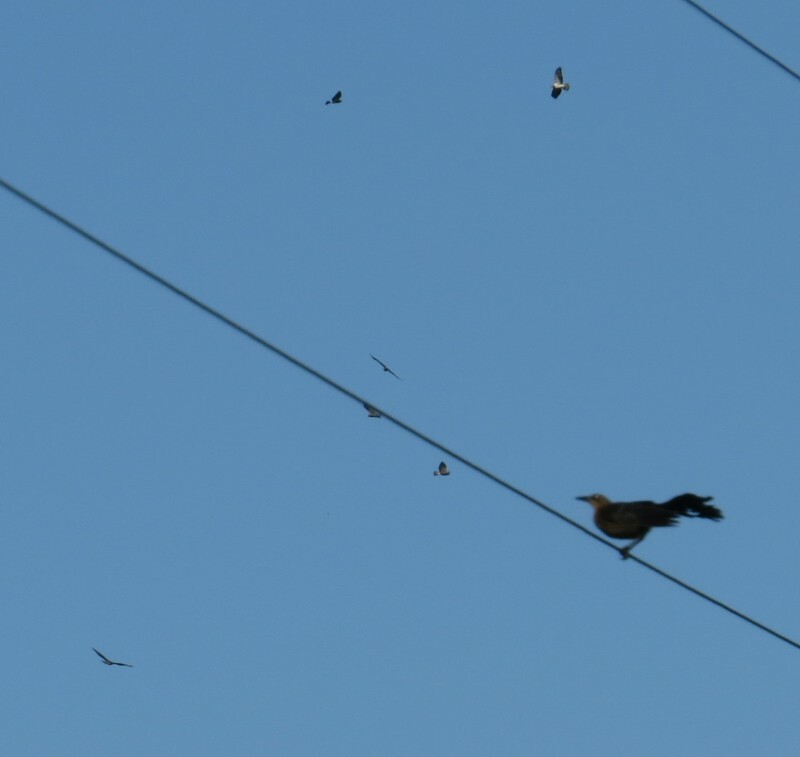 Look past the female Great-tailed Grackle to see distant Swainson's Hawks kettling! From there we checked out the resaca that was part of the Ebony Unit of Las Palomas, picking up a hovering White-tailed Kite on the way. 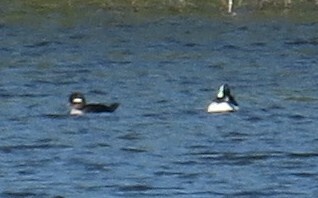 At the overlook there were lots and lots of Ruddy Ducks in every conceivable plumage, but the bird of the day for me was a pair of Bufflehead, as they can be tough to get sometimes! Least Grebes were trumpeting but remained hidden (one that I thought looked like one might have been a funny-looked Pied-billed), and in the songbird department a Carolina Wren was singing in the parking lot, and a Scissor-tailed Flycatcher swooped past. Back at the parking lot, the Smiths scooped up their little Chihuahua when an Osprey flew overhead (although they acknowledged he was probably in no danger, but that led to stories of eagles having dog for breakfast)! 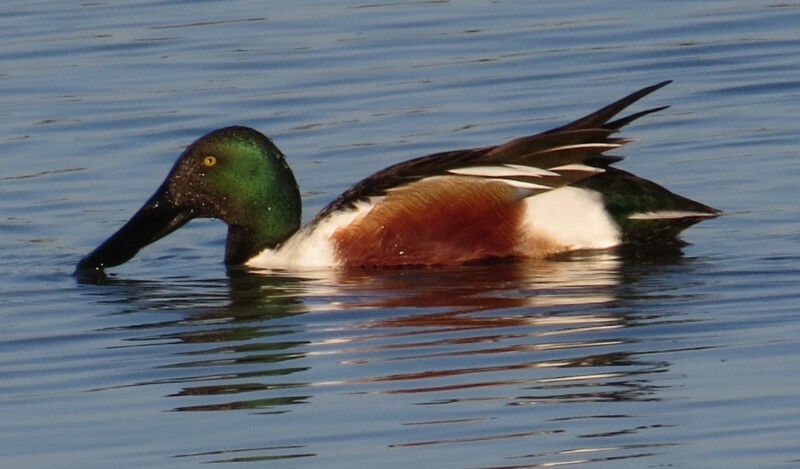 We poked down the street a little to view the resaca in better light, and wound up adding a whole bunch of new ducks: Gadwall, Ring-necked, Scaup, and even a female Redhead! (Everyone got a better look at the Bufflehead from this angle, too...) A Sora called from the reeds, and our only Harris' Hawk of the day made a quick dash behind some trees. 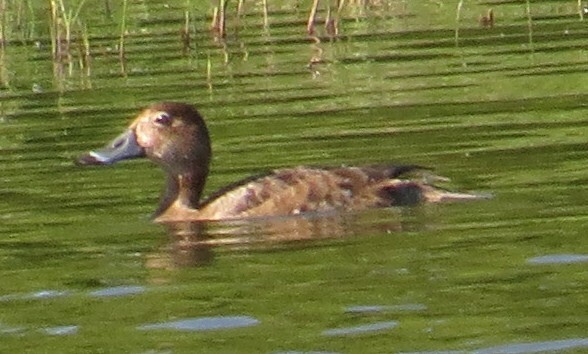 On either side of the female Ring-necked Duck are male Ruddy Ducks: the one on the left is still in non-breeding plumage, while the one on the right is in full breeding plumage. 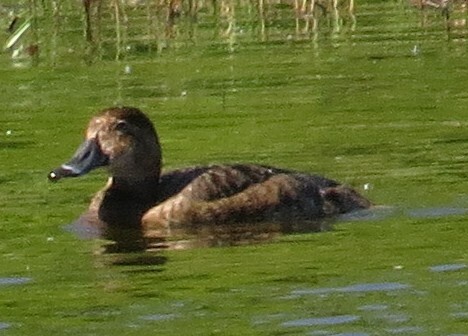 Here are two females and one non-breeding male Ruddy Duck, showing where the subfamily name "stifftails" comes from! This female Redhead had us going for a minute - in these photos it's obvious what she is, but in different lighting she almost looked like a Cinnamon Teal! 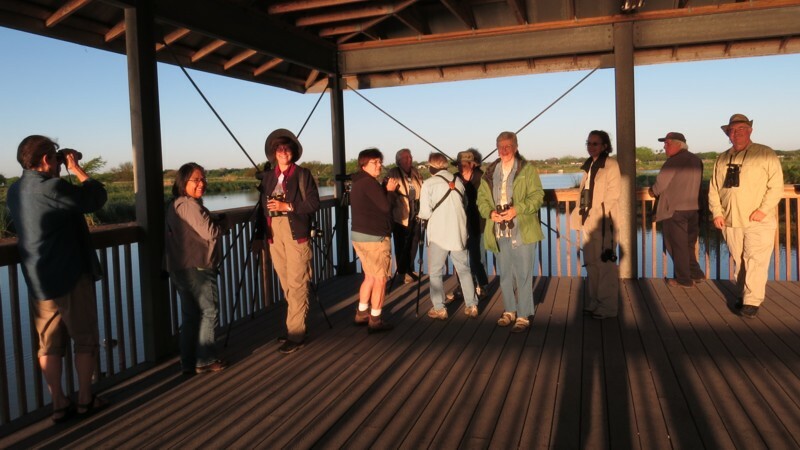 I'm always a little nervous about these "seat of your pants" Birder Patrol trips, especially when you have a bunch of people, because you're kinda under pressure to deliver (at least I feel like I am), so I just said, "Okay, Lord, I'm just trusting You to lead us to where the birds are!" Well! We made a stop at the Stripes right on the border of Harlingen and San Benito, and before most of the gang even made it to the potties, they had discovered a wet spot behind the parking lot that was just stuffed with stuff, including both kinds of yellowlegs, Mottled Ducks, Cattle Egrets, Caspian Terns, Laughing Gulls, and probably the best of the best - two Solitary Sandpipers and a Pectoral! Who woulda ever thunk the back of a Stripes store would be one of the best stops of the day?! 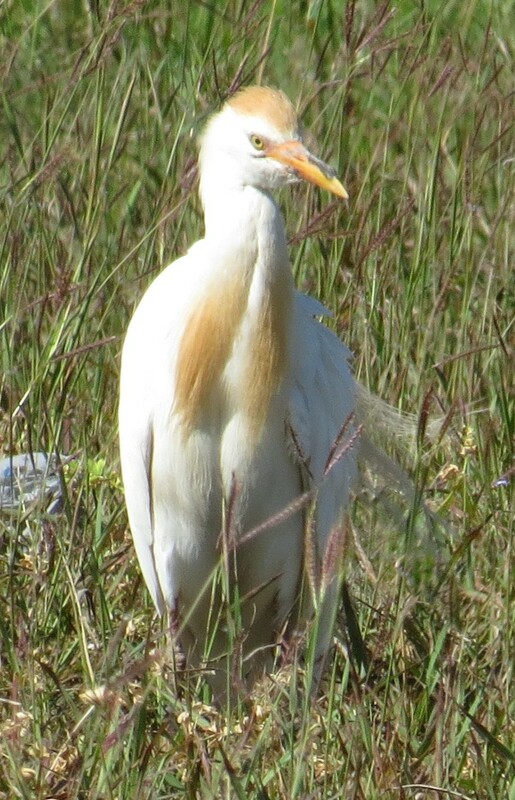 One of several breeding-plumaged Cattle Egrets behind the Stripes in san Benito. The area where the Stanfords had reported about 800 (I think that was the number) American Golden Plovers was along FM 510, ironically close to where I had been looking for the reported Glossy Ibis the week before. We found plenty of flooded fields, but no shorebirds (and no place to pull off, which was problematic). Then we headed up FM 803 to FM 106 where Pat had some Golden Plovers earlier in the month, but no go there, either. we did, however, come across a pond that had bunches of Blue-winged Teal and White-faced Ibis, along with a couple of Black-necked Stilts; we probably provided comedy relief to the guy feeding his chickens as five cars tried to maneuver on this dirt road and spot the Black Vultures flying overhead at the same time (which I missed)! 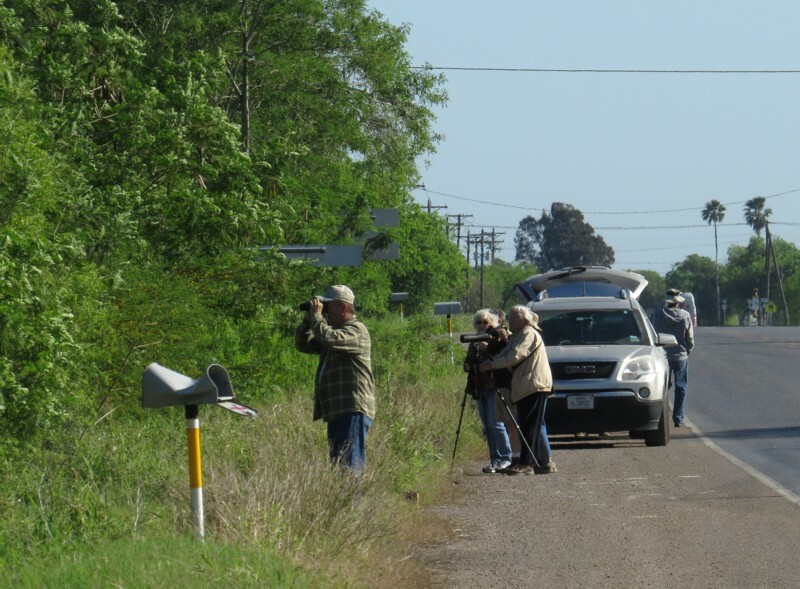 We decided to call it a day after that, making another pit stop at the Stripes in Rio Hondo, where we stuffed Ann and Mike into Joyce's Bird-Mobile as they needed to go back to La Feria and the rest of the crew wanted to keep birding and head back towards Harlingen. We took the shortcut through Combs and decided to swing by Tiocano Lake, seeing as neither Ann nor Mike had been there. A small flock of shorebirds did wheel in that we couldn't ID, but the stars of that stop were about 20 Roseate Spoonbills all tucked away, along with some Green-winged Teal joining the rest of the ducks!